For the first time ever, I went to a Halloween party. Well, to be fair, it was more of a “get together” than a party. There’s a difference. My CO*OP family and I got together at our founder’s house for snacks, games, and super intense discussions on rousing topics. As the self proclaimed class baker, I knew I wanted to bring something awesome. Two of my CO*OP friends requested chocolate cupcakes with black frosting. I’m all about pleasing people, even if it meant coloring some buttercream black (not that visually appealing but whatever). Regular chocolate cupcakes seemed so passé, so I went a slightly different route. If you know me, you know that I LOVE putting booze in things. Sometimes, I put it where it doesn’t belong. I can’t help it! Liquor is every baker’s secret weapon, whether they admit to it or not. There’s just something about putting liquor in stuff that makes things awesome. It might be the liquor itself or the devious feeling I get from secretly putting it in things. Tomato, potato; same thing. These cupcakes are extra boozy and special because it has not one, but two different liquor components. The cupcakes themselves are made with Guinness. Now, I know what you’re thinking; “beer in cupcakes?! NO WAY.” YES WAY! Guinness and chocolate are actually secret BFFs. There’s something about the dark richness of stout that pairs so well with chocolate. Not only that but the beer also helps the cupcakes stay super moist. Double bonus! The second introduction to booze in this recipe is through the ganache filling. At first, I thought adding a filling was a little extra but the more chocolate, the better! It’s just an ordinary chocolate ganache but with a couple teaspoons of whiskey. Here’s the part where I tell you I wish I had put more whiskey in this. I wish I had put more whiskey in the ganache. Do yourself a favor and add more liquor in there because what doesn’t kill you, ends up making you a little tipsy. I swear my goal was not to get my friends drunk. Well, maybe considering I also brought rummy bears with me. Not really because the cupcakes couldn’t do it. Even so, they were fantastic. This was my first time dealing with beer, so I was skeptical but then surprised with the results. The cakes were super rich and chocolatey, with a slight taste of hoppyness (I guess?) from the beer. That was the only indicator that there was any beer in the cupcakes, unless I told you beforehand or you’re some type of beer wizard that just KNOWS when you taste things. 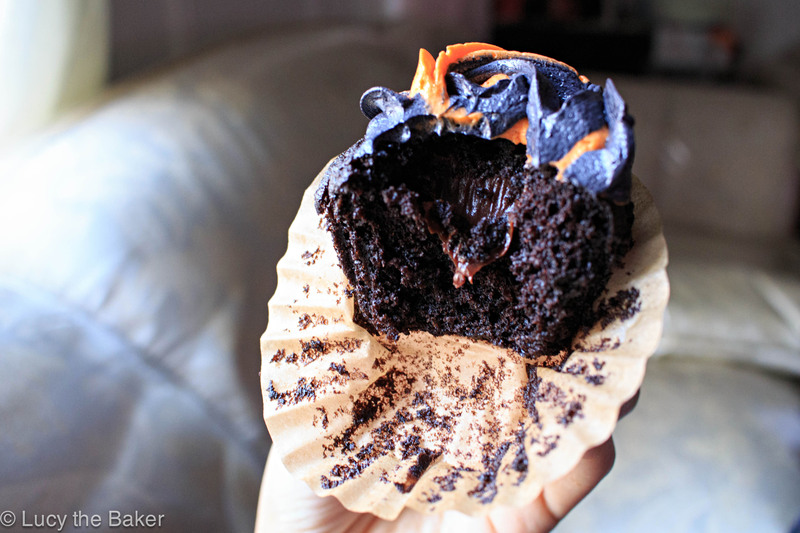 The stout helped keep the cupcakes moist and make the chocolate taste more like chocolate. I guess it works a little like how coffee enhances the chocolate flavor. Then the ganache. Not too sweet with that hint of whiskey. It almost tasted like caramel. I don’t know what kind of sorcery the whiskey did in there, but I was all about it. Let’s talk about the frosting for a minute. This isn’t your typical buttercream. I have been hearing on the internets about this awesome method for frosting that required less butter and sugar, but still had the buttercream taste. Intrigued, I decided to go for it. Initially, these cupcakes were supposed to have even more booze in the frosting, per Deb’s original recipe. Like I said above, I wasn’t about to get my friends drunk off cupcakes, so I refrained from adding more. Either way, the recipe is just as easy as regular buttercream. Basically, you make a roux out of flour and milk on the stove, until it’s thick like cake batter. Yes, there’s flour in here. I know, I was like “whaaaaa” when I saw it but trust; it works. Let that cool completely before proceeding to the next step, which is creaming softened butter and some sugar. Just one cup of butter with a cup and a quarter of regular granulated sugar. WAIT. Granulated sugar? I was skeptical about this too, considering you can feel the sugar even after creaming the crap out it. After joining the cold roux and the creamed butter, magic happens because it turns into a light and fluffy dream. It’s lighter than traditional buttercream but still has the taste. You can’t feel the sugar granules at all. Like MAGIC. For the cupcakes: Preheat oven to 350°F. Line 24 cupcake cups with liners. Whisk flour, sugar, baking soda, and 3/4 teaspoon salt in large bowl to blend. Using electric mixer, beat eggs and sour cream in another large bowl to blend. Add stout-chocolate mixture to egg mixture and beat just to combine. Add flour mixture and beat briefly on slow speed. Using rubber spatula, fold batter until completely combined. Divide batter among cupcake liners, filling them 2/3 to 3/4 of the way. 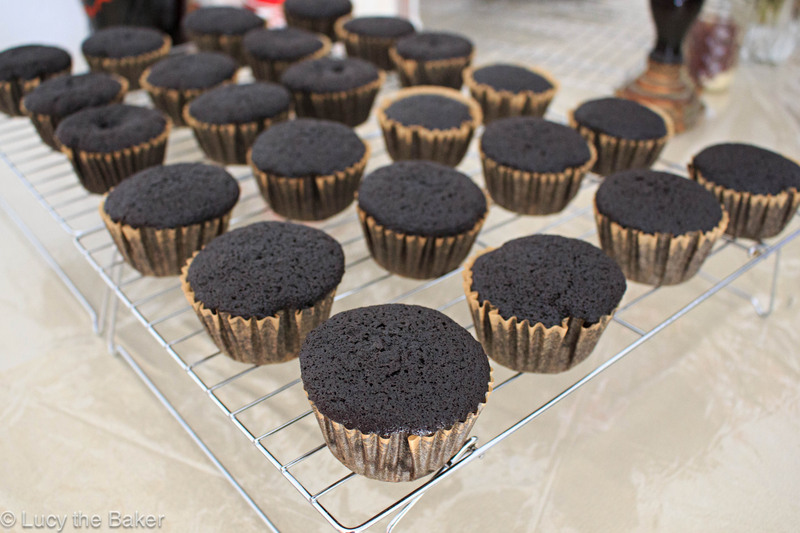 Bake the cupcakes until tester inserted into center comes out clean, about 17-22 minutes. Cool cupcakes on a rack completely. For the ganache: Place the chocolate chips in a heatproof bowl. Heat the cream until simmering and pour it over the chocolate. Let it sit for one minute and then stir until smooth. Add the butter and whiskey and stir until combined. Fill the cupcakes: Let the ganache cool until thick but still soft enough to be piped. Alternatively, you can spoon the filling into the cupcakes. 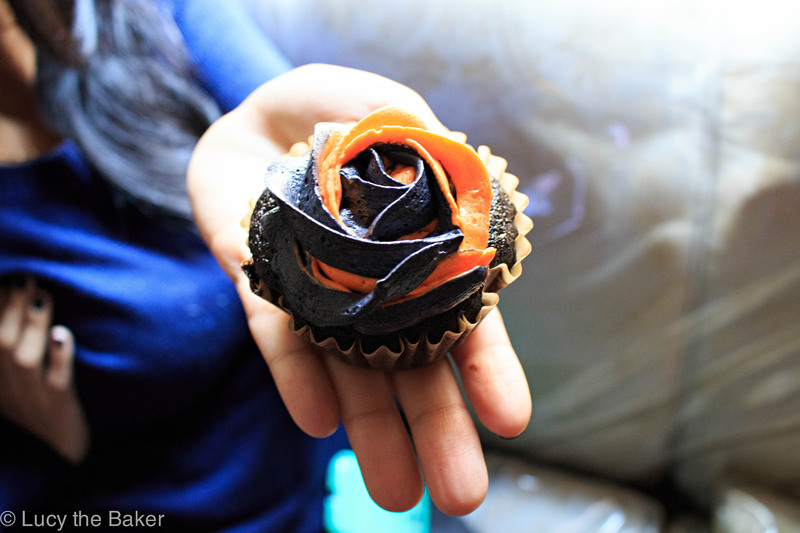 Meanwhile, using your 1-inch round cookie cutter, an apple corer, or a paring knife with skilled hands, cut the centers out of the cooled cupcakes. You want to go most of the way down the cupcake but not cut through the bottom — aim for 2/3 of the way. 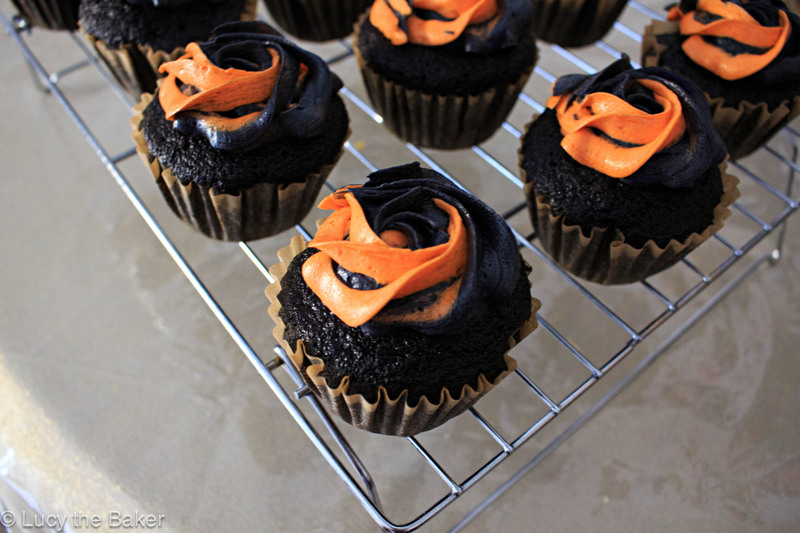 Put the ganache into a piping bag with a wide tip and fill the holes in each cupcake to the top. Or use a teaspoon to spoon the filling into the cupcakes. You can put a “lid” on the filling, by adding the tops of the cut centers back on the filled cupcakes but that’s optional. Cooked Whipped Frosting – adapted from Can You Stay For Dinner? In a medium saucepan, whisk together the flour and milk over medium heat. Keep whisking and cooking until the mixture has thickened and resembles cake batter; about 7 minutes. Take the mixture off the heat and stir in the vanilla extract. Let mixture cool completely. In a large bowl with an electric mixer, cream together the softened butter and sugar until light, pale, and fluffy. This can take anywhere from three to 10 minutes, depending on how long you can go. You basically want the sugar and butter to be really incorporated. Don’t be afraid to beat it more! Add the completely cooled flour mixture to the creamed butter, and beat until completely incorporated, making sure to periodically scrape the bowl. Add food coloring, if using. 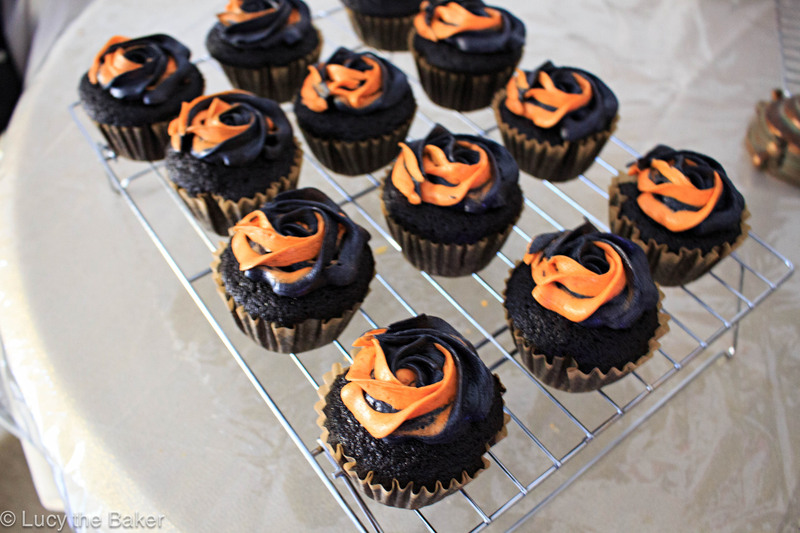 Place the frosting in a piping bag and frost cooled cupcakes. Enjoy! I used Hershey’s Special Dark cocoa powder in the cupcakes for three reasons; it was the only Dutch processed cocoa in the supermarket, it’s my favorite, and it tastes good. I don’t have a small circle cutter, so I used a paring knife to cut out the circles freehanded. Use what you have! I also skipped the piping bag for the ganache, and opted for a teaspoon to fill the cupcakes.